A dental laser functions by generating heat energy in the form of light. The wavelength used varies from tissue type and importantly, procedure type. The Solea Laser, currently the best dental laser on the market, has an extremely fine laser beam down to 9.3 microns, blowing away all other dental lasers not he market. 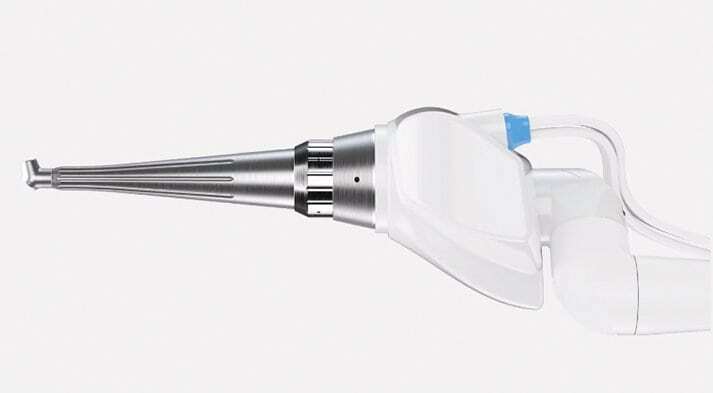 Because of this, Dr. May can use the laser to as a cutting instrument or a tissue vaporizer, including for cosmetic surgery procedures and gum shaping, as the Solea dental laser is known for its ability to precisely target an exact area of the mouth, no matter how minute. Dr. Yuriy May employs laser dentistry because of the many benefits and uses it holds for Connecticut patients at our West Hartford and Farmington, CT practice, and also because of the medicine free, anesthesia free, chemical free, and drill free tranquility it affords patients. Dr. May’s Solea laser was FDA approved in 2015, and together with the best laser on the market, Dr. May has been and continues to transform dentistry. Not all lasers are created equal. The Solea Laser is optimized for both hard and soft-tissue dentistry, allowing Dr. May to be the most advanced laser dentist, modifying teeth, bone, and soft tissue with ease, based on settings and technique. The Solea Laser is the most advanced laser on the market today and it allows Dr. May to perform a number of treatments that other dentists simply cannot do. Quite simply, just because a doctor owns a laser does not mean that he or she can perform the treatments made possible with the Solea Dental Laser. In fact, the chances are that any other “laser dentist” will not be able to perform what Dr. May can! Most lasers on the market today are diode soft-tissue lasers that are best used for cutting gum tissue only. These lasers are great for simple soft-tissue surgery like gingivectomies, but unfortunately, that’s about it. Dr. May distinguishes himself from West Hartford, Farmington and all Connecticut dentists through his training, expertise, and incredible versatility of use of the Solea Laser. Practically every procedure done by Dr. May incorporates laser dentistry and the Solea Laser. Tooth Extraction: Extractions are quicker and easier, with far less post-operative discomfort for the patient. Dr. May recently performed a complex surgical extraction on a woman who exclaimed that she had little to no post-op pain or swelling following treatment, and was able to go back to work immediately. During her post-operative follow-up, she was ecstatic; a co-worker of hers underwent a similar extraction by conventional means and was swollen and in considerable pain following the procedure. She told her friend she saw the wrong dentist! Periodontal Treatment and Bone Regeneration: By utilizing the Solea laser in a process called Laser Guided Regeneration, also known as the Annapolis Procedure, in conjunction with Oral DNA Periodontal Pathogen testing, a patient’s periodontal disease can be stabilized and at times even reversed, their teeth can be preserved, and their whole body health can be improved, all with a treatment that frequently requires only a topical anaesthetic (no injection) and has little or no post-operative pain. Furthermore, it is now possible for the body to heal itself and regenerate bone lost to periodontal disease prior. This was previously thought to be impossible, but Dr. May has monitored and documented such improvement among his patients through radiography. Cavity Detection: Dr. May routinely uses low-level lasers to detect any portions within tooth enamel that can result in a cavity. If any potential cavities do turn up, the dentist can cover the small area with a clear sealant, thus preventing a cavity from forming. Removal of Decay and Damaged Gum Tissue: As an alternative to the dental drill, lasers allow for a comfortable, anxiety-free treatment. For instance, our Solea Laser can be used to clear out decay during a nearly painless process that does not even require anesthesia. Gum recontouring: Our dentist can correct “gummy” smiles by reshaping the gum line of each tooth. This virtually painless laser procedure can be a great complement to a cosmetic dentistry treatment, such as porcelain veneers. Frenectomy (also known as frenotomy) is a simple procedure used to correct tongue tie, in which the frenulum is surgically removed. This is done with the Solea Laser as the optimal and preferred method. No anaesthetic is needed for children, and minimal topical anaesthetic can be used for infant comfort. With laser frenectomies, the results are better, with minimal bleeding and a lower risk of relapse. Tongue Tie is a condition formally known as ankyloglossia, in which the frenulum – the thin bit of tissue that connects the tongue to the floor of the mouth – is too short, restricting movement. Affecting nearly 4% affects of all infants tongue tie can make breastfeeding difficult for mother and child alike. A related condition, lip-tie – in which the tissue attaching the upper lip just above the upper front teeth is too short – can likewise interfere with feeding. The frenectomy procedure performed by Dr. May resolves the tongue tie, allowing the children to feed more easily and, in turn, receive the essential and rich nutrients and antibodies an infant needs. Research has suggested that in addition to resolving feeding problem, a frenectomy results in a smoother breastfeeding process bolstered the emotional connection between mother and child. Hardening materials: Composite resin is typically used for fillings and bonding. Once the material has been applied and manipulated to blend harmoniously with your smile, Dr. May will apply gentle laser energy to the area for a hardening effect. During cavity treatment, the laser can also strengthen the bond between the filling and tooth. Biopsy or lesion removal: A biopsy involves testing a tissue for malignancy, cancer or other pathogens. A laser can be utilized to remove tissue for this reason, preventing significant bleeding and swelling, often seen with scalpel and traditional procedures. It can also work to remove lesions in the mouth and target canker sores to alleviate associated discomfort. Solea Laser is the Miracle Technology Dentistry Has Been Waiting For! 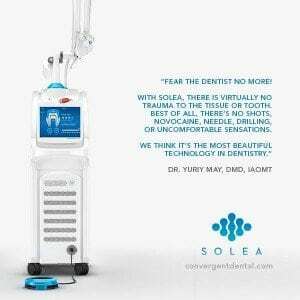 Solea is a powerful dental laser that replaces the dental drill in the majority of procedures in our practice. While in use, the patient experiences virtually no pain, vibration, or noise. In fact, nearly every patient skips anesthesia because they just don’t need it. Solea is our way of keeping patients happy, wowed, impressed and not fearing Dr. May’s ultra comfortable and luxurious dental chair. Because more than anything, Dr. May loves to see patients smile, not just to see their teeth, but because they love our revolutionary technology! Why is the Solea Laser the best dental laser on the market? The majority of hard- and soft-tissue procedures in our office are done with no anesthesia, and soft-tissue procedures are done with virtually no bleeding. Blood-free and anesthesia-free procedures represent a major leap forward in dentistry, as we are able to execute multi-quadrant dentistry, fillings on the fly, and soft-tissue procedures in a single appointment. What does that mean for Dr. May’s patient? Patients are now able to receive the care they truly need in a fraction of the time—and pain they were accustomed to from traditional drills. Solea is also far less invasive than using a traditional handpiece, which makes healing time following a procedure much shorter. When patients have anesthesia they typically leave the office with that numb feeling still prevalent. With Solea, patients are able to go right out to lunch or back to work without that numb sensation following your appointment. Business meeting after seeing Dr. May? None issue with Solea Procedures! Romantic date after seeing Dr. May? None issue with Solea Procedures! Solea is truly changing what it means to go to the (Top) dentist – or Connecticut’s Best Dentist – Dr. Yuriy May. A frenectomy (also known as a frenulectomy, frenulotomy or frenotomy) is the removal of a frenulum, a small fold of tissue that prevents an organ in the body from moving too far. It can refer to frenula in several places on the human body. It is related to frenuloplasty, a surgical alteration in a frenulum.